Former President George H.W. Bush was hospitalized Sunday in Maine after he experienced low blood pressure and fatigue, a spokesman said. Bush arrived in Maine for the summer May 20. Coming about a month after the death of his wife, Barbara, of 73 years, the family said the 41st president was eager to return to the family compound on Walker's Point. He has visited every summer since childhood, the only exception being the years of his World War II service. The former president was hospitalized in April, shortly after the death of his wife Barbara. 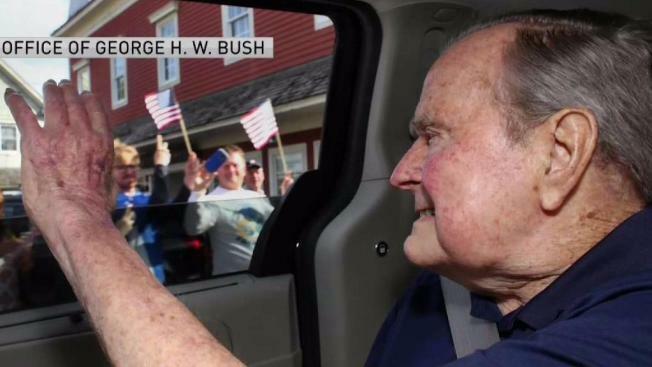 Following his release from a Houston hospital, Former President Bush was welcomed one week ago to his summer home in Kennebunkport, Maine by well-wishers who lined the dock square for his arrival. Bush was seen in photos Saturday joining veterans at an American Legion Post in Kennebunkport. He was joined at the event by his friend and former national security advisor General Brent Scowcroft. He had been scheduled to attend a Memorial Day parade in the town Monday. Bush, who has a form of Parkinson's disease and a history of pneumonia and other infections, was hospitalized in Houston on April 22, the day after his wife's funeral, for an infection. He remained hospitalized for 13 days.